Beautiful You: Blogmas Day 11 | My Christmas Desk! 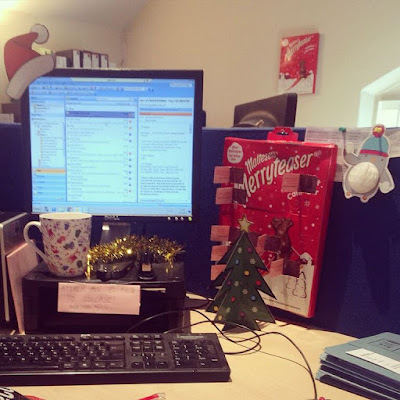 Blogmas Day 11 | My Christmas Desk! So I have to be honest this whole blog post wouldn't exist without Zoella's advert calender for Alfie, it was one of his presents and when I saw this on her vlogs I had to have it. 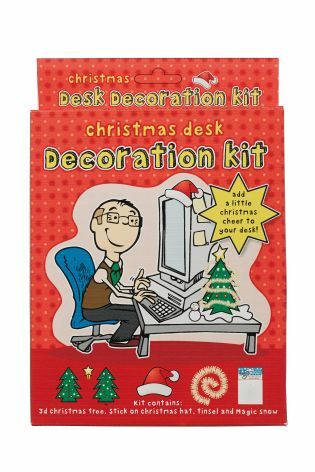 It is a Christmas Desk Decoration Kit and it is from Next, you can find it here online for £4, anyway this set comes with a 3D Christmas Tree, Tinsel, a Christmas Hat sticker for your monitor and MAGIC SNOW!! I thought that I was such a good idea and we love being in the festive spirit at work and these were perfect and at such a low price we really couldn't resist. I will insert a picture of my desk below, I haven't used the snow as I didn't think it was appropriate in an office but I will be using it at home- I'll keep you posted on that one!